Most of the microbial IAQ sampling methods collect fungal spores and hyphae. Spores are minute propagative units (propagules) that function as seeds, usually with some food reserve, but not containing a preformed embryo. The fungal spores that are important in IAQ investigations are generally between 2.0 and 10 mm in length. The mechanism by which spores are produced is the basis for classifying fungi. This is why identification using culture analysis is the primary method of choice. Spore types that are important in IAQ investigations include ascospores, basidiospores, conidia, and sporangiospores. The major functions of fungal spores are maintaining the populations, spreading genetic variability, and extending their distribution range. Spores are dispersed mostly by air, but can also be dispersed by water, arthropods, larger animals, plant seeds or propagating materials, and human activities. Because fungi have the ability to produce massive numbers of spores, fungal spores are among the most common microbial particles in outdoor and indoor environments. 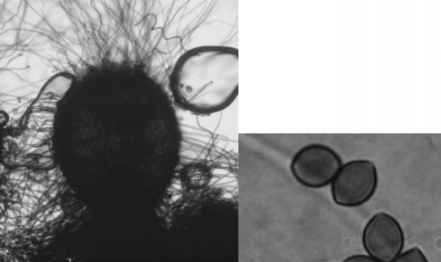 Many factors such as water, nutrition, temperature, light, and pH can determine the viability of a fungal spore, as well as influence the process of a fungal spore developing into a sporulating colony, as illustrated in Figure 5.1. Understanding of these factors may help both laboratory and investigators design a suitable culture method to maximize recovery of fungi. Fig. 5.1. 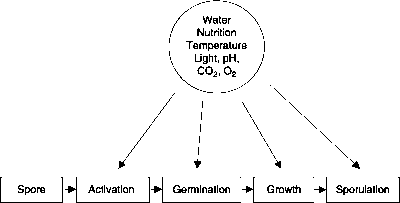 To develop into a sporulating colony, a viable spore must undergo a process consisting of spore activation, germination, growth, and sporulation. Many factors such as water, nutrition, temperature, light, and pH can influence the process. represents only about 1% of total spores.6 Because there are so many variables, it is not realistic to estimate the survival rate of fungal spores in an indoor environment.